46 Bolshaya Yakimanka Street, Moscow (tel. : +7 499 238-20-56), Metro station: "Oktyabrskaya". The Church of St. John the Warrior was first mentioned in 1625. At that time, it was situated on the bank of the Moscow River, close to the Krymsky Bridge, approximately where the precincts of the Central House of the Artist (CHA) start and where Yakimansky Lane and 2nd Babyegorodsky Lane intersect; it was known as the Church of St. John the Warrior "by the Krymsky Court, on the bank". John the Warrior was the patron saint of the "streltsy", the members of the elite guard units, who had lived in that area since the 1550s by the order of Ivan the Terrible. Being situated at the foot of a hill, the river often flooded the Church somewhat. In general, the entire area was prone to heavy flooding up until the Vodootvodny Canal was built in 1786. 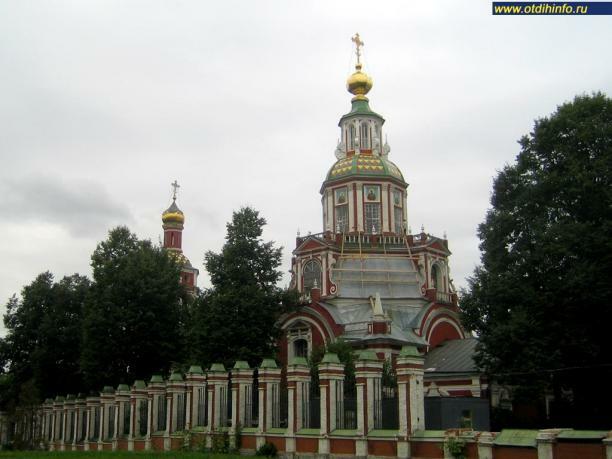 By the efforts of the "streltsy", the construction of a new, stone church started. The Church was completed in 1671, but it did not last for long. After one of the Streltsy Uprisings, those of them who had survived, together with their families, were expelled from Moscow; the Church was abandoned, and it was flooded during the 1708 flood. According to an eyewitness, in 1709 "there was a great flood of the river Moscow, water reached the stone bridge and the windows, swept away the entire households together with building and people, drowning many people and flooding many Churches, including God's temple of John the Warrior beyond the river Moscow." There is also a folk legend, according to which Peter the Great, while going along Yakimanka Street, saw a church surrounded by water and parishioners approaching it by boat. Having learned that this was the Church of St. John the Warrior, the tsar cried: "This is our patron saint! Tell the priest that I would like to have a church of stone, on a high place, in the very Bolshaya Street; I will make a donation and will send him a design." Two months later, he himself came back with a design and, seeing that they had already started bringing construction material, praised the priest. And he allegedly wrote in the book for recording donations: "I donate 300 roubles. Peter." The name of the priest who accepted the donation from Peter the Great, in the name of God, was Father Alexius Fyodorov (passed away in 1731). In 1712, for the purpose of setting up a church cemetery, a vacant plot of land and several households from the "streltsy"-owned tithe-paying land were allocated. The Moscow governor, Duke Mikhail Grigoryevich Romodanovsky, cancelled tithe-paying from this land, ordering its owners to pay only "road money" used for setting in order the roads situated in the vicinity of their estates. After some time, a new governor, the boyar Aleksey Petrovich Saltykov, ordered to also collect tithe. This way, the Church of St. John the Warrior accumulated some debt (in 1714–1720): "89 roubles 22 altyns and 2 dengas of tithe money and 24 roubles of road money." For the Church's consecration, in 1717, Peter the Great sent golden vessels, a painting and a heavy weight with a massive chain attached. The latter was hung at the entrance to remind people of keeping order during church services. The painting, which was over 2 "arshins" (around 1.42 meters, or 4.6 feet) long and wide, had an inscription at the top: "The pharmacy that heals sins." However, there are strong grounds to believe that even earlier it was planned to rebuild the Church on a new site: for example, a plot, part of the streltsy-owned tithe-paying land, was bought for the construction of a new church as early as 1702. But, apparently, it was the wish and funds of Peter the Great that kick-started the construction of the Church of St. John the Warrior. The Church was designed and built by one of Peter's favourite architects, Ivan Petrovich Zarudny (passed away in 1727). As early as 23 (11 Old Style) June 1711, in the Church's south-eastern corner, a side-chapel of the Holy Martyrs and Confessors Gurias, Samon and Habib (commemorated on 28 (15 Old Style) November) was consecrated, starting services at the Church. The grand consecration of the Church was performed, on 12 June 1717, by Metropolitan Stephan (Yavorsky) of Ryazan and Murom, the Patriarchal "locum tenens". Since that day, which is considered to mark the beginning of the Church's new life, as Fr. Nazarius, the hegumen (abbot) of Valaam Monastery, profoundly noted, "the Guardian Angel of the Lord's Altar has been permanently present in God's temple." According to a document, dated 1721, that has survived, the priest Aleksey Fyodorov paid 5 roubles to Agafya Chertikhina, the widow of a watchman at the Uniform Chancellery, for her buildings (probably, a house and utility buildings) situated near the church in Bolshaya Kaluzhskaya Street (as Yakimanka Street was known then), while she sold the land on which all that stood to the Church of St. John the Warrior, to be used for building an almshouse. This way, alongside Peter the Great, the priest Aleksey Fyodorov should be considered to be a founder of the new Church of St. John the Warrior. In 1752, a significant event took place in the history of Orthodox Russia: the relics of the Holy Hierarch Demetrius of Rostov (commemorated on 4 October (21 September Old Style) and on 10 November (28 October Old Style)) were discovered uncorrupted and later canonised. The year when St. Demetrius passed away coincided with the year when the foundation stone of the Church of the Holy Martyr John the Warrior was laid. The burial of the holy hierarch was performed by his friend, the same Metropolitan Stephan (Yavorsky) who also consecrated the Church. This way, the newly-appeared holy hierarch and the Church existed almost at the same time and were spiritually related. The intertwined dates and events inspired the parishioners to ask for the new altar to be consecrated in the name of this saint. This way, in 1760 the Church of the Holy Martyr John the Warrior acquired its third altar. In 1812, during Napoleon's invasion, the Church of the Holy Martyr John the Warrior was desecrated by the French. "Attracted by gold, silver, pearls and precious stones, the French could not open the Church's western gate and broke the southern gate off; then, after opening the northern one, which was locked from inside, they led their horses into God's temple. Searching for treasures, they were breaking the floor and cutting walls, but the treasures were nowhere to be seen. They noticed a cellar, right beneath the altar, but, instead of descending there through a passage on the Church's northern side or through the windows (the lower ones), they were breaking through the altar's lower vault, without knowing that the cellar's southern part, near which the treasures lied, was separated by a stone wall." ("An Eyewitness's Recollections of the French Occupation of Moscow in 1812", Moscow, 1862, pp. 82–85). The Lord saved the Church from the fire as well: the flame, raging in Yakimanka Street, stopped at the Church's fence. The Church and the street's entire right side, up to the Kaluzhsky Gate (where Kaluzhsky Square would appear later), remained untouched by the fire. After the French left, the altars were reconsecrated: the one of SS. Gurias, Samon and Habib on 20 February, the one of St. Demetrius of Rostov on 9 March and the one of St. John the Warrior on 29 June, all in 1813. Those several days when the Church was being looted have remained up until now the only days in the Church's 300-year history when church services were not performed in it. Thanks to generous donations and precious contributions, the Church gradually restored its plate and ornaments, by as early as 1840 having reached its former glory. In the times of the Communist persecution, by the will of God, it fell to the Church's lot to become one of the few sources of true Orthodoxy in Moscow. In 1922, for his loyalty to Patriach Tikhon and to his duty, Fr. Christopher (Nadezhdin), the Church's abbot and the archpriest of the Zamoskvorechye District, was killed, dying as a martyr. In the 1990s, he was celebrated as the Hieromartyr Christopher. Nowadays, the Church's parishioners pray to him asking him to give them strength in their faith. Thanks to the prayers of St. Christopher and all the heavenly patrons, the Church managed to avoid the wickedness of Renovationism, remaining loyal to the canonic authorities. The Church was not shut down, but in 1922 its church plate, ornaments and other valuables were confiscated. One more service fell to the Church's lot: it was to keep many great Christian sacred objects brought to the Church in the 1920s and 1930s from shut-down Moscow churches. Among these objects were the icon of the Righteous Joachim and Anne from the church after which Yakimanka Street was named, the icon of St. Basil the Blessed from the eponymous cathedral in Red Square, the relics and icon of St. Barbara the Great Martyr from the eponymous church in Varvarka Street. The icon of the All-Merciful Saviour of Smolensk and the one of St. Nicolas the Holy Hierarch were earlier over the Moscow Kremlin's gates that were named after them. The now-existing wonderful, carved and gilded, iconostasis ("icon-stand") was built in 1708 for the Church of the Three Holy Hierarchs at the Red Gate, before being transferred from there to the Church of the Holy Hierarch John the Warrior in 1928, when the Church of the There Holy Hierarchs was demolished. The Church of St. John the Warrior saw one of the last changes in 1984, when, due to the street being widened, the church fence, erected in 1746–1758, was moved to a new setback line.